Amore Beds mattresses are recommended by 69% of owners on GoodBed (based on 26 ratings + 7 reviews). Do you have something to say about your Amore Beds mattress? Write a Review! Cotton Details: Luxuriously quilted organic cotton with a naturally soft and durable feel. Therapeutic copper ion infused bamboo fabric as an option. 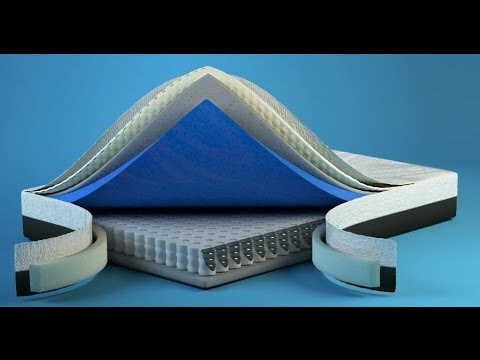 Memory Foam Details: Our modernized memory foam is comfortably supportive, contouring to your body, moving with you as you change positions, and helping to keep your spine properly aligned. Third Comfort Layer Details: Hyper-Contouring Open-Cell Transition Foam. Gently transitions from the comfort layers to the more supportive coils while allowing body heat to pass through. Wool Details: Exceptional brethability for cool and dry sleeping comfort. Firmer Side Support Layer Details: 2" High Resilient Load Deflection Foam. Provides for a sturdy core for a firmer transition. Gently isolates individual pressure points one at a time. First Support Layer Details: 6-Inch Wrapped Coils & Reinforced Edge Support. Provides individualized support, increased airflow and bouncier feel with dual-density perimeter coils for edge-to-edge comfort. Pocketed Coils Details: Each coil is encased individually, allowing it to gently respond as you change sleeping positions, adjusting to the contour of your body. Since each spring reacts as needed–instead of all springs being affected simultaneously–motions are isolated and partner disturbances are minimized. Second Support Layer Details: Ultra-Supportive Breathable Foam Base. Additional durability and strength for lasting comfort and quality. Softer Side Support Layer Details: 2" High-density Open-Cell Specialty Foam. Contours to your body for pressure relief and proper spinal alignment. Reduces tossing and turning. Mattress Thickness: 11" to 13"
Note: The product line specifications above were derived from the active Amore Beds models listed on GoodBed. As a result, these details may not be comprehensive and may not apply to all Amore Beds models. If you are seeking specifications for a particular Amore Beds mattress, please search for that mattress by name on GoodBed, or check with your local Amore Beds dealer. Which mattress from Amore Beds is best for you? 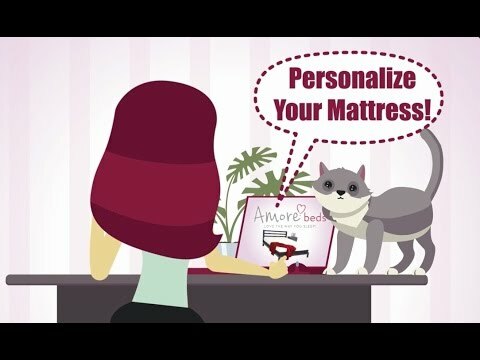 Before shopping at Amore Beds, take a short quiz to find which of their mattresses best matches your unique needs and preferences. Powered by GoodBed’s intelligent matching technology, you can even get your personal match score for each of Amore Beds's available mattresses, in addition to other online options that match your criteria. Love the Way You Sleep! Have an update or correction to our information about Amore Beds? If so, please take a moment to suggest an edit. Amore Beds mattresses are only available online.